Two of the most important days of my life took place in 2005 and 2009, each consisting of being surrounded my peers, waiting for my name to be called, hearing it, walking across a stage in my first big-boy suit, receiving a handshake from a powerful man, smiling for the audience, praying that I didn’t trip, and then returning to my seat, elated that my hard work had somehow paid off. These two events, high school and college graduation, will always be significant because they are not only personal victories but also important moments for the people who helped me reach that milestone. They do more than just sit and look pretty. These guys get put to work. 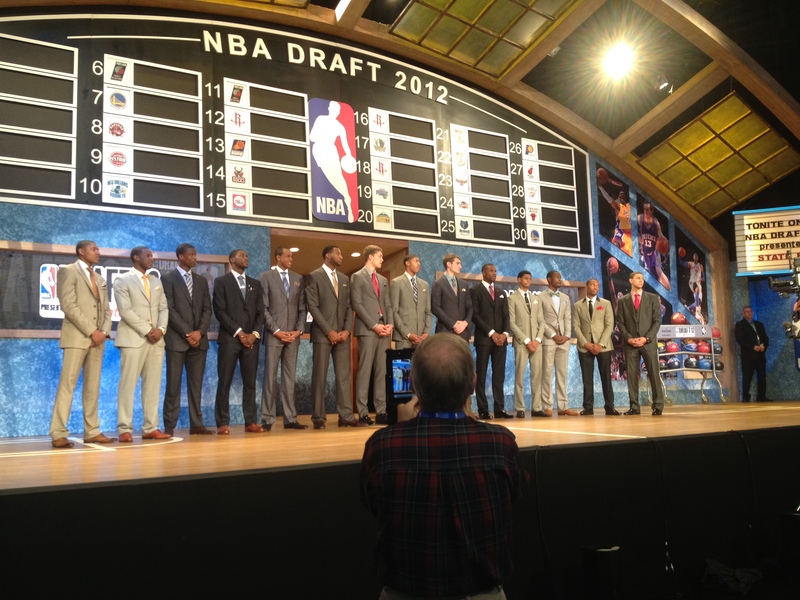 As the 14 lottery picks arrived to the arena, their first task was a group picture. As with any group of young men, the full spectrum exists between looking tough and smiling. 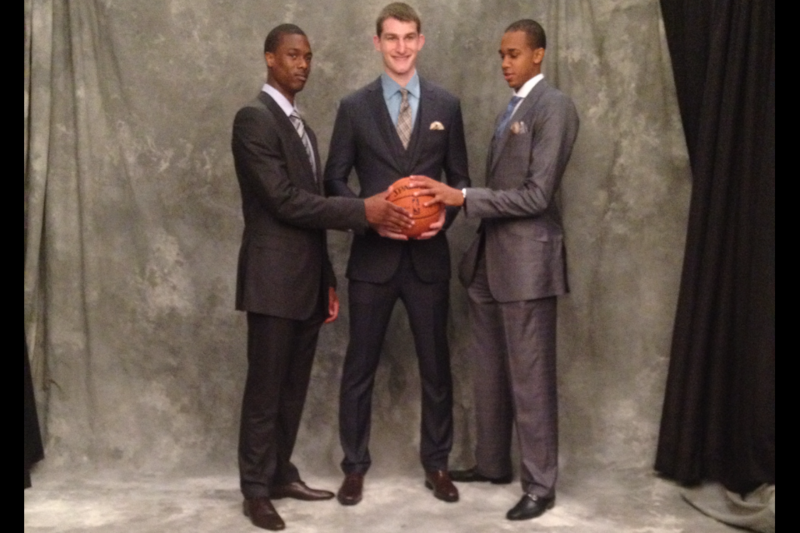 They quickly learned that looking cool by way of hands in pockets was unacceptable. Hearing these future millionaires get yelled at by the camerawoman was a comforting thing, because at that very moment, you remembered that these were still boys. Yes, in an hour’s time, they could make an argument for being men, but for a few final moments, these were boys. Boys that needed to take their damn hands out of their pockets or else. I wore a suit and carried a briefcase to the draft, which is only important because on numerous occasions the “put your head down and confidently walk like you belong” worked in my favor. This was one of those times, as I followed the players from their group shot to a room where they’d have their first picture with Principal Stern. Stern was chatty during this session, excited to meet these players. But that wasn’t what he was most captivated by. He was struck by the players’ shirting. How on earth can you boo a guy who is this cute for two straight hours? If this is a Drumline reference, 50 points to you, Mr. Henson. Congrats on holding the top spot in the 2012 Draft Fantasy Swag Game that takes place only in my brain. The area referred to as the “green room” wasn’t really a room. It was a sectioned-off area where each player had a round table for his closest loved ones. Unfortunately, for the first 20 minutes in the room, no one’s family had made their way into the arena. This became last-minute text time for some of the players, as well as a break to eat some sliders and taquitos that were on the menu. Few players really dug into the food, however, which was probably wise considering taquitos + nerves = THE WORST. They also had laptops at their stations, which reminded me to go check my e-mail. As I returned to my seat, I noted that my Wi-Fi was down. Bummed, I got back up and walked around more, only to learn that everyone’s Wi-Fi was down. Oh, Bad Internet, such an equal opportunity employer. To this point, everything seemed structured and organized and orderly. And then the families showed up and the chaos that any celebratory event entails became a reality. This is where the graduation parallels come in. From the Who’s Sitting Where, to the outfits, to watching how these very large boys interact with their parents, grandparents, siblings, former coaches, and agents, the whole experience seemed very human and familiar. Seeing Austin Rivers stand between John Calipari and Doc Rivers (above) normally would have seemed businesslike and professional. At this moment, however, it felt like that moment when a parent reintroduces his or her kid to someone they’ve met 100 times, and that kid stays quiet until the big kids are done talking. We’ve all been there, but Austin is one of a handful of people to ever have that experience 20 minutes before landing in the NBA. 1. Hear name, stand up, receive your snapback. 2. Walk up to stage, shake Principal Stern’s hand, smile for camera. 3. Walk off and listen to analysts critique your game publicly while you stand there. 4. Have first interview, use time to convey excitement about new home, organization. Also, thank God. 5. Wave at crowd, sign first professional autograph. 6. Point at your people in the crowd, which, in the case of Michael Kidd-Gilchrist, included more than 100 people. I’m not kidding. 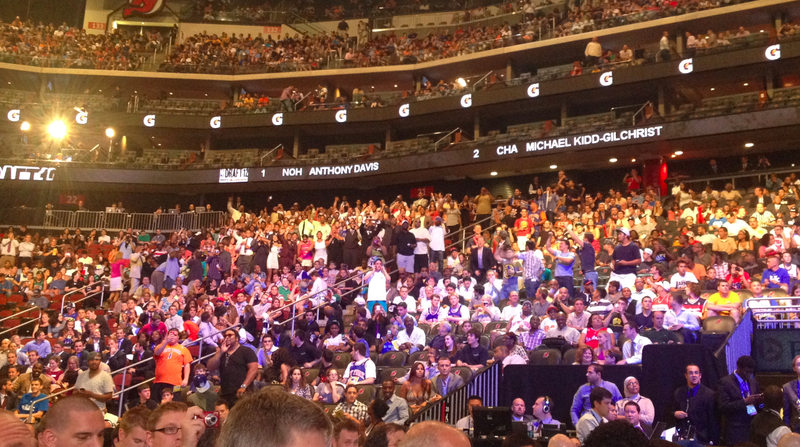 Look at that sea of Kidd-Gilchrists. 7. Have your first radio interview. 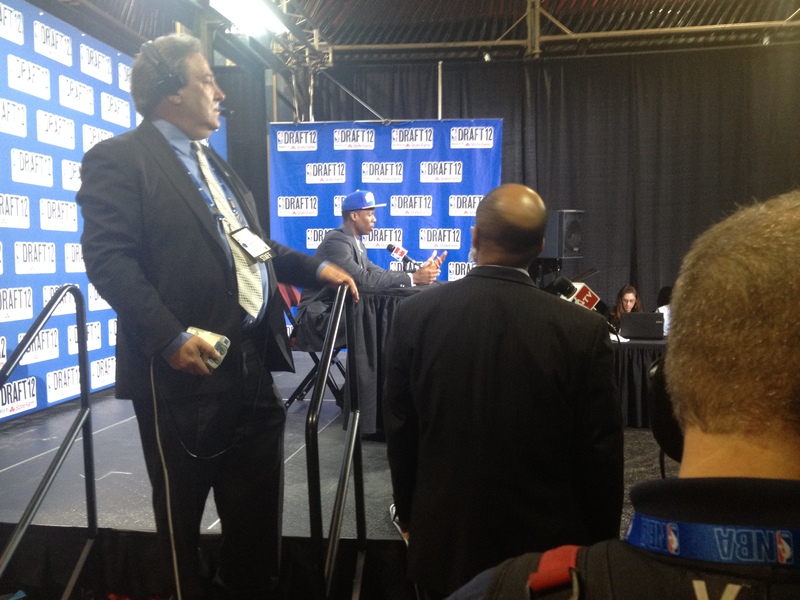 Or, in Jeremy Lamb’s case, let Papa Doc steal your seat for five minutes, then have your first radio interview. 8. Walk to other side of arena, acknowledge chants/heckles by the drunk alums from your school. It’s worth revisiting the Green Room because it’s a very different place once all of the lottery picks have been chosen. Moms are wearing snapbacks, Stern did a walkthrough to shake people’s hands, and grandmas are wearing snapbacks (MORE ON THAT LATER). As soon as they made their way into the tunnel, it was time to field those first questions from the media. As the clear front-runner for natural media-savvy, I watched as Golden State Warriors–bound Harrison Barnes handled questions with the ease of a seasoned veteran. He did say one thing that amused me, however, because it actually made me feel old. Interviewer: [Can you] talk about how you’re looking forward to working under Mark Jackson? Barnes: Yeah. I always had a lot of respect for him when he was an analyst, and as a player as well. Browne: Yeah, there’s no way I average 20 points as a post-up point guard in 10-and-under without Mark Jackson, so saying I’m excited would be a gross understatement. But hey, to each his own. This kid Barnes is terrifyingly comfortable with a microphone in his face. Watch out, Arsenio. And others use it exactly how I would: making fun of one another. This was the scene as Maurice Harkless recorded the same sound bite over and over and over again. Hi, this is Maurice Harkless of the Philadelphia 76ers, and you are watching NBA Action. After a few attempts, Andre Drummond walked over, caught his eye, laughed while saying, “They got you reading this thing like 500 times,” and then three minutes later was in the same seat doing the same thing. After all on-air duties were fulfilled, the players made their way back to the start for some more photos. Yes, some of these pictures were with other players, but for the most part this was the post-graduation scene: hugs, photo ops, and tears. 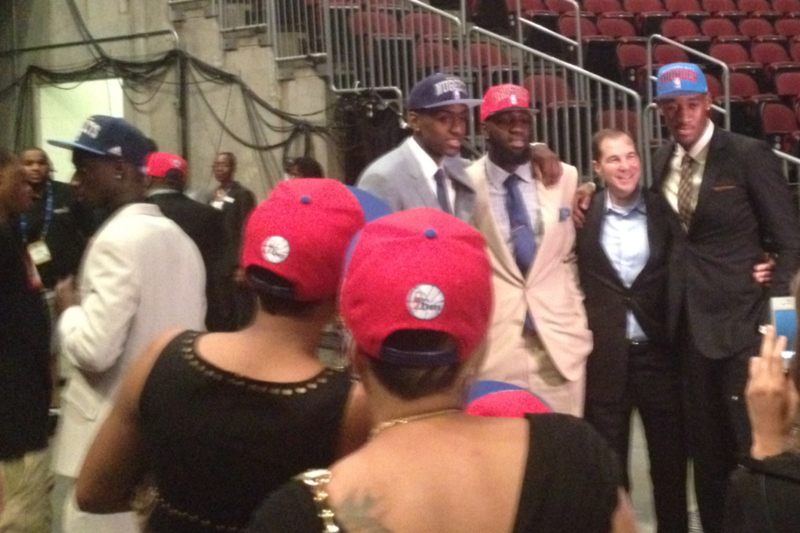 It was easy to pinpoint who was with which family because of the unofficial star of the evening: the snapback. If that’s not the most classic I taught him everything he knows look, I don’t know what is. After 30 minutes in the family station, each player and his family filed out. After nearly two hours of wave after wave, things calmed down. All of the lottery picks that had once inhabited the Green Room had made their way through the circuit. 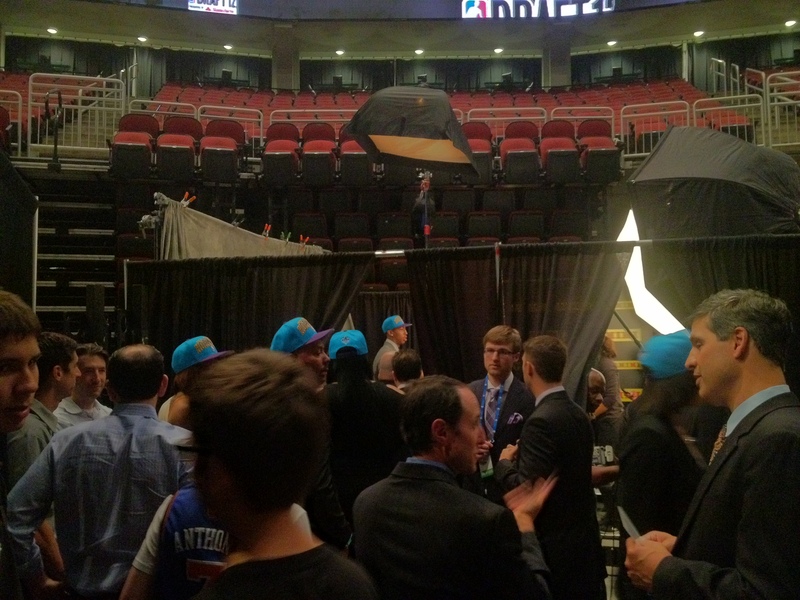 They weren’t the only draftees in the arena, however. 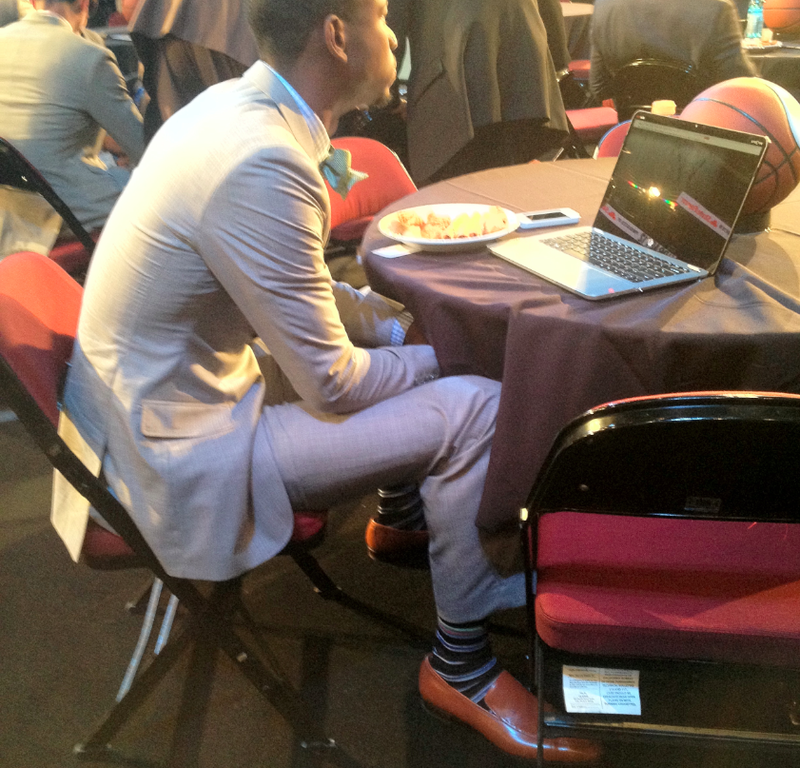 There was Perry Jones III, seated in the audience with his family. 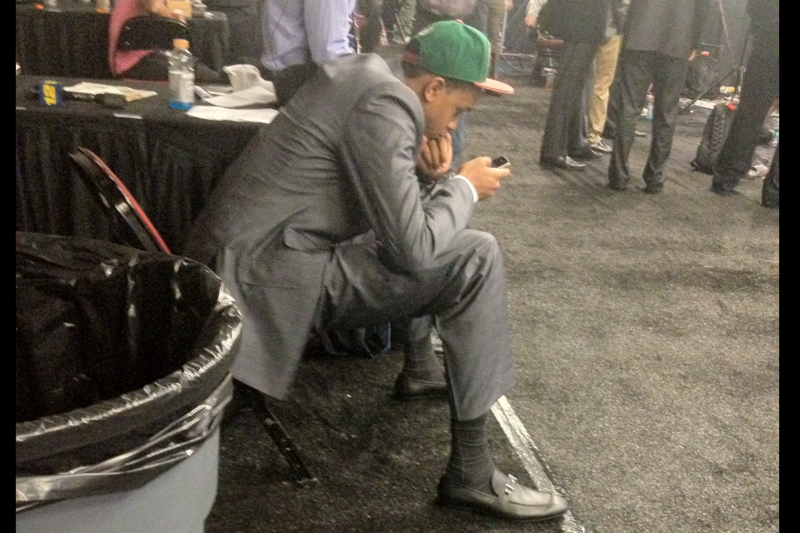 Jones sat with a confused, sad look on his face as pick after pick went by in the first round. On two occasions, previously picked players, making their way back into the arena, stopped by Perry to just offer him some kind words. 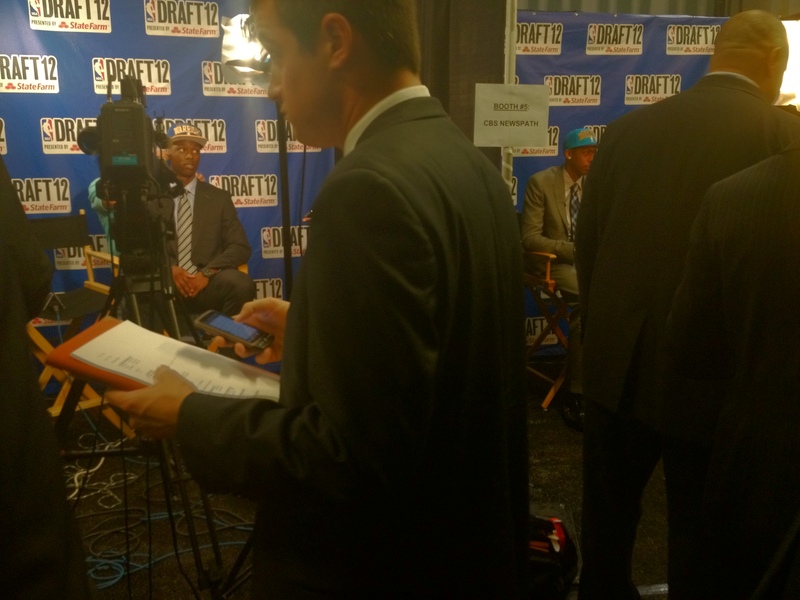 Milwaukee-bound John Henson, waiting his turn in the On-Air Media Room, saw the board and couldn’t believe his eyes. Perry hasn’t been picked yet? That’s crazy. The Heat might get him, though. He was one pick off, as the Heat passed on him at 27 and one spot later the Thunder added him to their almost-championship roster as the 28th pick. Perry made his way from station to station. He could have been humiliated. Instead, he was a first-round pick. 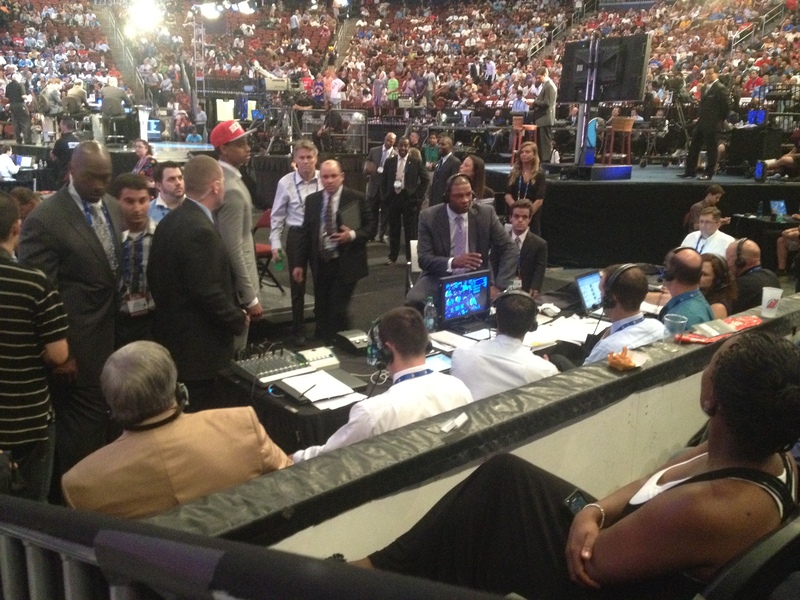 Then there were Quincy Acy and Quincy Miller, two of the last audience draftees — they share a first name and a college (Baylor), and just happened to be drafted back-to-back (37th and 38th) while sitting in the same row. For five minutes, after a series of people who were not in attendance were drafted, the arena was revived with the respective Quincys’ elated family members. As those two made their way through the circuit and raced to the family area, they stumbled upon their Baylor teammate Perry Jones III. The three close friends seemed thrilled to be spending this time together, despite their low draft slots. They were with their families, but they were also a family. And then there was Kevin Jones. The West Virginia forward was in attendance with his family, one section over from the Baylor crew. But as the second round raced to a conclusion and Prudential Arena began to clear out, Jones sat there, just a row above my seat, staring out into nothingness. With 10 picks left, a “Kevin Jones” chant started in the crowd. He didn’t smile. He actually seemed more embarrassed than uplifted. With seven picks left, a caravan of individuals came by with a few encouraging words. 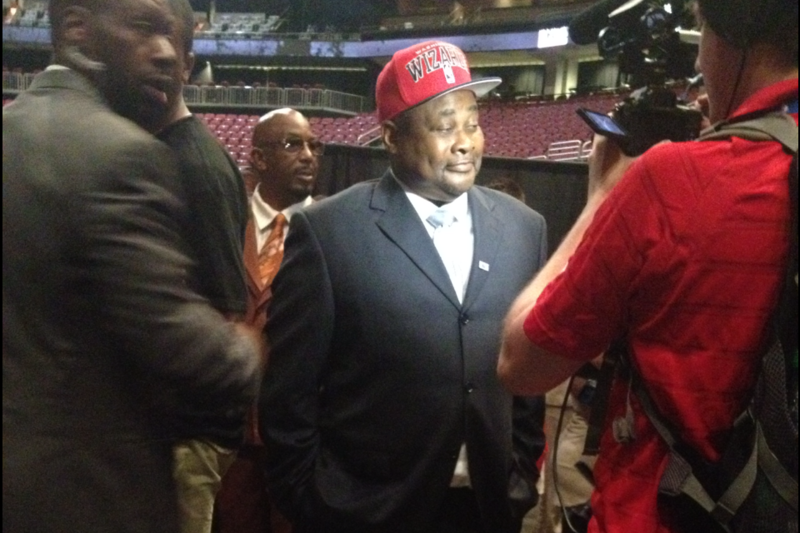 And with five picks left, I turned around to see two members of his family in tears, almost in disbelief. The nightmare seemed to be coming true. Five picks later, it came true, but they weren’t there to see it. 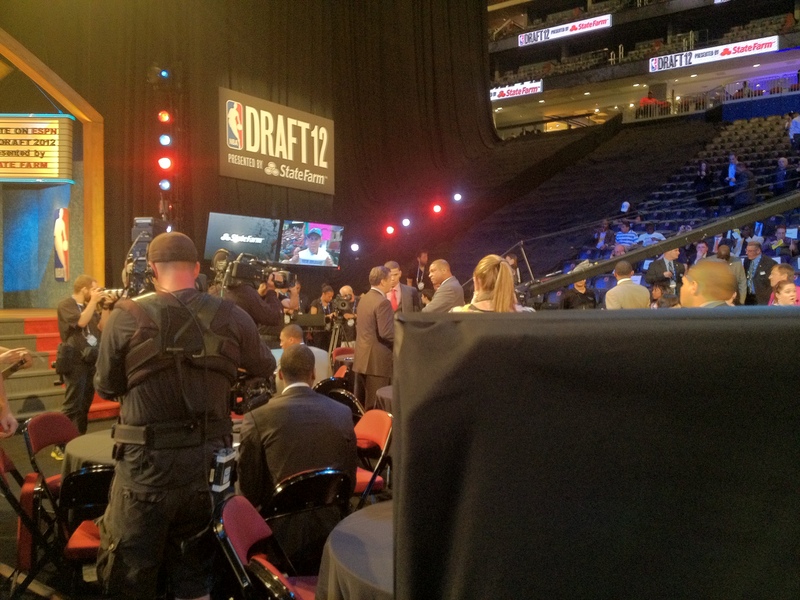 Before Adam Silver came out to announce the 60th and final pick, Jones and his family had made their way past me and out of the arena. To leave, however, they had to exit through the excited-family area, forced to look at people taking pictures, hugging, and crying for a very different reason. As Kevin Jones and his family marched through the sea of the elated, tension finally hit the previously gleeful event. And for three minutes, all of my joy connected to this graduation ceremony had been erased. It was the basketball version of Waiting for Superman, the documentary about the lottery that exists within the charter school system. For the kids who make it, you’re so happy for them. You know in an instant that, with a single announcement, their lives have changed forever. But the ones left on the outside looking in are so painful to watch, you almost wish the system didn’t exist in the first place. Going to the league and getting a high-quality education for a child aren’t perfect parallels, but at that moment, that’s how I felt about the NBA draft. The Jones family’s departure didn’t completely halt the party, but there was a subdued, Wow, we’re lucky feeling in the room. Talent and intangibles are important in graduating to the next level, but for those who weren’t the premier picks, there’s no factoring out luck. Just ask Kevin Jones.